I see a lot of issues with searching, and thought we might ought to have a search thread for people to put in hints. >>>>> "rear axle" >>>> with quotes, will return occurrences of the phrase rear axle where the word rear is followed by word axle with one space in between. >>>>> rear axle >>>> without quotes, will return any threads where rear and axle both appear in thread, even if different people posted the two words. ------>Cannot search on less than 4 letters. So, can't search just V6 as an example. ------> If having trouble, try searching with GOOGLE (or perhaps your favorite search engine) using colorado fan & then the words or letters you want to search. 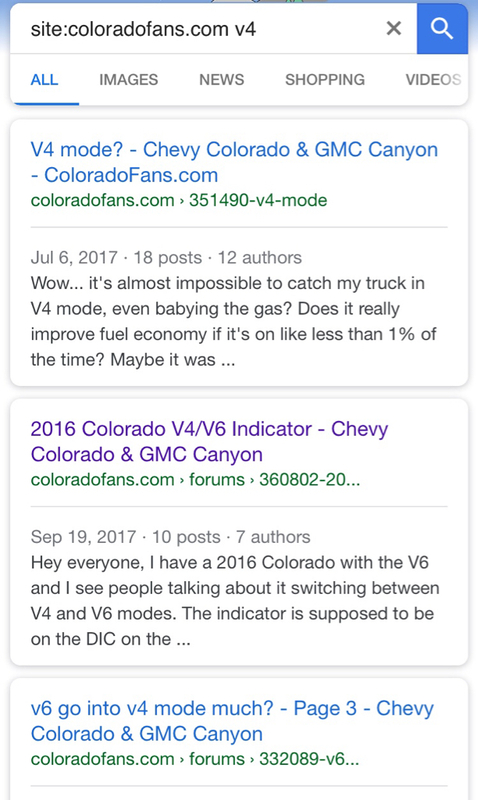 I recently used "colorado fans v6 v4" without the quotes to search on google and find threads about the V6 & V4 modes on the 2017/2018 V6 engines. Toughsox, dmaxjr, dave66rivi and 2 others like this. Using the example of the V6 and V4, you can use V6+V4 without quotes to return items that have both V6 and V4 listed. Using an * can help for different word syntax, as in Running*Board will return RunningBoard and "Running Board"
When I'm searching on google, I put ColoradoFans in as one word which changes the sort order and almost ensures that anything from the forum comes up on top. For those unfamiliar with Google Rankings, they will put items that rank higher or pays them more to have their items come up first in a search. What?! You can search on here?!? But searches must be 4 or more characters so v6 will not work. In his case, v4 would be optimum as there are lots of threads with v6 but few with v4. Was just a poke at one who seemed to notice. Also recommend using "Advanced Search"
Using advanced you change restrict the search to topic titles, so that youre not getting hit on any random matching word in any post or user signature. Also using advanced you can restrict your search to the forum that makes sense to what your looking for. ie If your looking for topics specifically for extended cab rear seats you can restrict the search to the interior section as nothing in the categories: wheels/tires, engine, etc would matter. CaryBosse and RayS like this. The 4 cylinder gas and Diesel engines are I4. Not saying you were referring to the 4cyl engines as V4s, but some people don’t know what the “V” and “I” refer to so they call them V4 engines. But for people wanting to know what the V4 indicator means it would be nice if the internal search would allow it. Also, when using Google to search you can limit search results to a specific site very easily. Just add “site:coloradofans.com” to the search query. No quotes needed. CaryBosse and Gryfer like this. A google search for anything related to 2nd gen twins almost always lists coloradofans.com 1st. It appears that coloradofans.com is the most informative place for 2nd gen twins on the internet. Or you could just log on here, don't bother with a search, start a new thread to ask your question and push a 'tude when someone suggests a search might be useful. CaryBosse and TMBSTN like this. Today 04:06 PM by Tom S.